Hi there Cooking Books readers; Amy here from Eggs on Sunday. Andrea was nice enough to ask me to write this month's Off the Shelf post; being a fan of her blog and all the luscious food she creates, I was happy to do so! When Andrea approached me about writing this post, she told me that I could write about anything I wanted, from any cookbook in my collection that I'm finding particularly inspiring. I decided pretty quickly that the recipe I'd talk about was one from the cookbook that's gotten the most play in my kitchen over the past year: Vegetable Soups from Deborah Madison's Kitchen. In fact, sometimes I think I should start another blog called “Cooking Deborah Madison's Soups,” or something like that, because I seem to slowly be working my way through her book. She has chapters for each season, filled with delicious-sounding soups utilizing vegetables at their peak, as well as chapters on hearty bean soups and broths. If you enjoy cooking seasonally (like I do) and are looking for new and interesting ways to cook your seasonal vegetables, this book has your name written all over it. I've been thumbing through it and dog-earing recipes year-round, and many of the pages by this point are splattered with the end results of the soups I try. My husband and I have a share in a local CSA during the growing season and through the winter, which means that we're faced weekly with a hoard of local, delicious vegetables that need to be used fairly quickly. Our winter share was heavy on the root vegetables, but also peppered occasionally with some other treats, like bags of dried beans from a local farm, Cayuga Pure Organics. One day, I was looking for a way to start using up some of these beans that had begun accumulating in my pantry, and turned to Deborah for inspiration. It was the dead of winter, and I was in the mood for something warming, hearty, and nutritious...a recipe that would make a big pot that I could leave bubbling on the stove for a few hours on the weekend, infusing the house with its delicious scent, and that we could eat multiple times during the week for lunch. My eyes locked on her recipe for Pinto Bean Stew – simple in preparation, but intriguingly chili-like in some of its flavors, and thickened at the end with a touch of cornmeal, which I knew would give it a really nice undertone of corn tortillas...yum. Instead of using just pinto beans, I like to mix a combination of black beans and pinto beans together, and the end result is a different – and better – creature than a humdrum bean chili. Something about the dried chiles that are simmered and then pureed with the beans, along with the cornmeal, makes it more interesting and (in my mind) even more delicious. 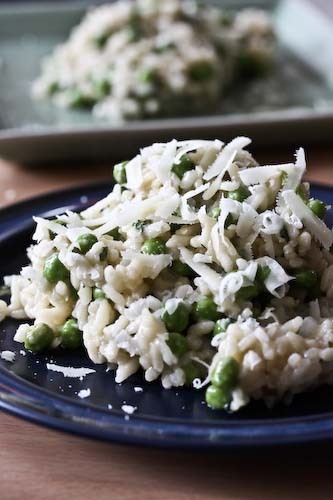 I serve it over short-grain brown rice, which has a nice somewhat sticky texture, and top it with shredded monterey jack and sharp cheddar cheese, chopped cilantro, sour cream and scallions. It's homey, feeds a crowd (or two people for about a week!) and is, to me, comfort in a bowl. Deborah uses just pinto beans in her stew, but I like to use a mix of pinto and black beans. You'll need to soak the dried beans overnight, so plan accordingly. Also, she uses dried New Mexican chiles; I usually use Ancho chiles instead. The day before you're going to make the stew, sort and rinse through the beans, place them in a large bowl and cover them with about 2 inches of water. Leave them overnight to soak. The next day, drain the beans and set them aside. Heat the oil in a large heavy pot, then add the onions, garlic, oregano, cumin, coriander, and dried chiles. Stir to combine and toast the spices a little bit, then add the beans along with 2 quarts (8 cups) water and 1 ½ teaspoons sea salt. Bring to a boil, then turn down the heat and simmer until the beans are soft, about 1 ½ hours. Puree two cups of the beans and any large pieces of chile until smooth, then return them to the pot. Whisk in the cornmeal and simmer for another 10 minutes, until the mixture thickens slightly. Taste for salt. The texture should be soupy, but punctuated with beans. Ladle some beans and their liquid over rice, and top with shredded cheese, scallions, cilantro, and sour cream. Great recipe! It sounds very comforting and delicious. This stew sounds so hearty and nourishing. It's been so cold, and this is just the thing I need to warm my bones. I'll be trying it this weekend for sure. Thanks Amy!